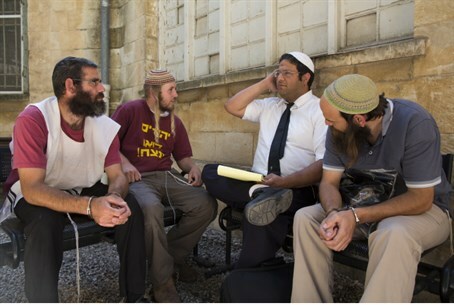 Itamar Ben-Gvir meets with Jews abducted and beaten by Arabs in Samaria; attacks IDF police complicity, media distortion of events. Attorney Itamar Ben-Gvir sharply criticized the IDF's handling of a clash Tuesday in which 30 Jews were abducted and beaten by an Arab mob in the Binyamin region, and accused Israeli media of distorting the events. "People doing 'price tag' (vandalism) don't go in the middle of the day, don't go about without means of defense, and don't do it in a group," argued Ben-Gvir after meeting with the abducted Jews. Unrest was fanned in the Binyamin region after border police destroyed Jewish vineyards using the "Disruptive Use Order," allowing the seizure of Jewish land even when no Arab claims the land. Jewish residents report being ambushed by the Arab mob later in the day while they were walking between Esh Kodesh and Givat Hayovel in protest of the destruction. Ben-Gvir visited the Jews Tuesday night, working to free them from arrest over Arab accusations that they were coming to Kusra to commit "price tag" crimes as nationalistically motivated vandalism by Jews has come to be known. "Once again the Arabs and leftists did an incredible media spin"
"I met four 15- and 16-year-old youths at the police station who are not connected to 'price tag,' nor have they ever been arrested before," reported Ben-Gvir. "They told me their story which fits with the pictures we saw." "The media is repeating tales that the youths came to carry out 'price tag,' but there isn't even partial evidence for that, and what's more, I've learned that a hammer presented by an Arab interviewed by the media was used by him to beat the youth," revealed the attorney. "Once again the Arabs and leftists did an incredible media spin." Ben-Gvir exposes that the media misportrayal is widespread. "I looked at the Facebook pages of settlers who are writers, who are supposed to present the side of the youth, but instead they completely adopted the version of the Arab criminals," said Ben-Gvir. Aside from the media, Ben-Gvir holds the IDF responsible for the violent attack. "According to what the youths told me, they called the IDF to help them, but at the start it didn't interest anyone," relayed Ben-Gvir. "Afterwards only two jeeps came. It's interesting to think what would have happen if they did a test and announced that there's a lynch, even of an Arab terrorist - would the IDF and police send two cars, or would half of the Yasam (SWAT) and border patrol swarm into the area?" Even after the IDF arrived, the attorney explained, Arabs continued to punch and kick the youths, without soldiers stopping the assault. A journalist reported on Facebook that a regiment commander stood at the side enjoying the sight of the attacks on the Jews, reports Ben-Gvir. "If it's true, the commander needs to be sent home today," argued Ben-Gvir. "Even if it had been a case of people wanting to commit 'price tag' vandalism, what happened to the rule of law? The principles of justice? What happened to the rule that it's forbidden to harm people even if they committed a criminal offense; is that a rule that only applies to terrorists?" By the end of Tuesday the youths were released by police on condition that they appear in court the next day. Ben-Gvir, who was hired by the NGO Honenu to defend the abducted Jews, accused the police of perverting justice. "I asked the commander if they arrested even one of the criminals, because after all there are pictures of Arabs beating, hitting, and causing serious injury to these youths," remarked Ben-Gvir. "The commander didn't answer. Instead they arrested the youths without any legal basis, even though they were released after I argued there's no way they should spend a night in jail after the trauma they went through." "Tomorrow the youths will be brought to court, but we plan to submit an appeal against these conditions," pledged Ben-Gvir. Ben-Gvir concluded by offering words of support to the youths. "Don't be dispirited, we all see the slander against you from all kinds of haters of the settlements who are thirsty for the blood of hilltop youth. Unfortunately there are even those in our camp that think they'll benefit in the media by joining the slander," said Ben-Gvir. "But whoever understands where they're leading the public opinion, clearly sees a trend against the settlements." According to the attorney, the youths "should have organized the (protest) walk (to Givat Hayovel) better...and prepared for the case that Arab criminals might try to attack them, but at a time like this when everyone is slandering them, I think that our obligation is to salute those who marched, those who protest the destruction of homes, and don't sit at home but rather try to do good for the people of Israel."